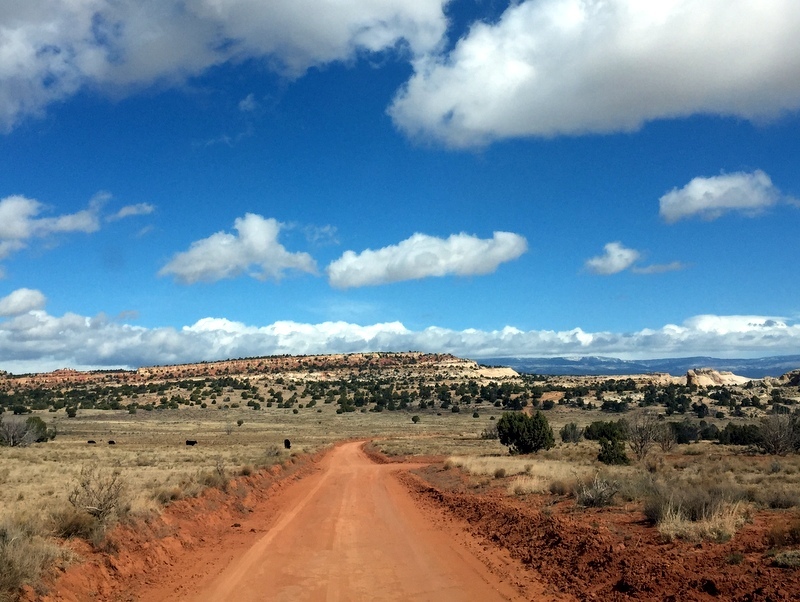 We left Bryce Canyon last weekend not knowing if our intended destination of Escalante was going to be feasible. 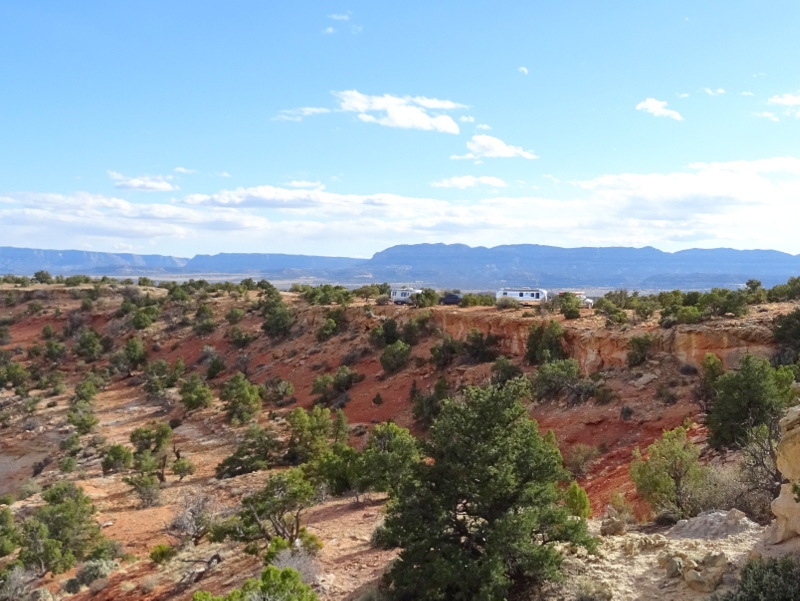 You see, this tiny, remote town on the edge of the Grand Staircase-Escalante National Monument has a reputation for being a dead zone for cell service. I know, I know…you’re sick of hearing about our never ending quest for a cell signal. Probably as much as I’m sick of writing about it. But the fact is that if we aren’t connected then we can’t work. And if we can’t work, we can’t travel. So until we win the lottery (fat chance since we don’t play) this is our reality. Our first stop was at the national monument visitor center at the edge of town. We hoped to get some maps of the area along with information about the rumored permits needed to disperse camp on monument land. Well, it turns out that the visitor center is not open on the weekends this time of year. Real helpful. While there we checked both our AT&T phones and our Verizon MIFI device. The phones were pulling in full bars of E (unusable for data) and the MIFI a 1XRTT signal (also unusable for data). It was not looking good. We drove through town while monitoring our devices and after a few miles came to the Hole-in-the-Rock Road. A quick right at the start of the road brought us to a popular boondocking area with about 10 RVs spread around a meadow. We found a quick spot to park, have some lunch and check the signal. Guess what? With our cell booster we got 3-4 bars of AT&T 4G and some Verizon LTE!!! We never expected that. After a look around we decided this could be a great place to spend the week, but first we had one more spot to check out. Tim had been chatting on the Airforums with a guy named Jeff who was boondocking in the area. Jeff and his wife Coffee had found a nice spot off Spencer Flat Rd. and reported an intermittent Verizon signal that sounded promising. This road is inside the national monument, but dispersed camping is allowed provided you use existing sites and don’t travel off-road. We passed a few sites marked with camping signs. Some were RV friendly and some were not. A mile or so in and we came to a large pull-off alongside a cliff overlooking the most magnificent view. A cursory check of the Interwebs showed a similar signal strength as the first spot. So we maneuvered ourselves between a low tree and the cliff overlooking the view, and cranked up the booster antenna. A few months ago Tim removed the batwing part of our over-the-air TV antenna (that we rarely used) and mounted the cell booster antenna on top. When the TV antenna lies flat the cell booster antenna pokes up about 10-inches above the roof, but when the antenna is raised it gets an extra 3 feet of so of height. For the most part we don’t need to raise it, but in an area like this where the signal is coming from far, far away the extra height makes a noticeable difference. We also have a directional antenna (that flat paddle looking thing) but are not convinced that it is working correctly. Tucked in our spot with the cell booster cranked up to maximum height. In any case, we’ve been here for five days and with the booster are getting 3-4 bars of AT&T 4G and 3-4 bars of Verizon LTE. The Verizon occasionally drops off to nothing, and then we simply switch over to AT&T until it returns. Without the booster both signals are weak and sometimes non-existent. So if you come here and need a strong signal to work, make sure you have a booster and good antenna (we like our weBoost and Surecall Omni-Directional Antenna). I’ll be posting more photos or our site and the surrounding area later in the week, but right now I’m anxious to share the story of two incredible slot canyons that we explored on Sunday. 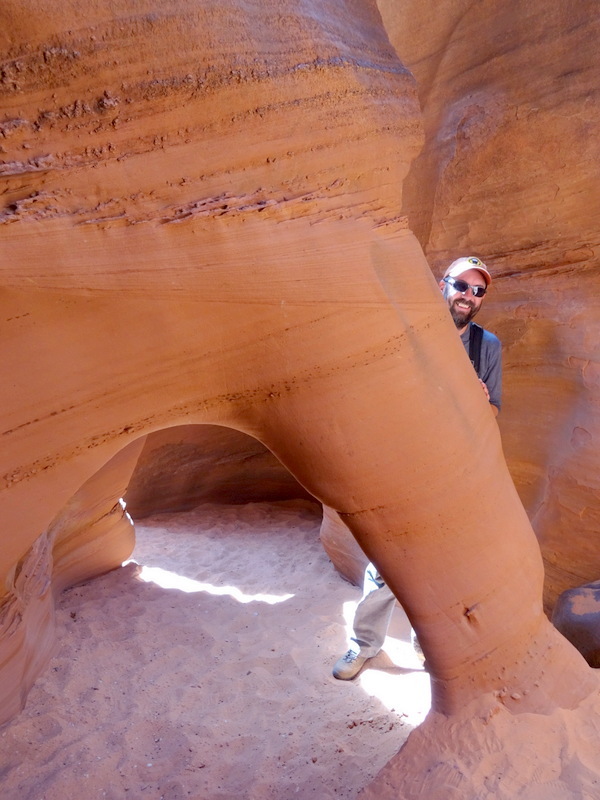 We’ve been in slot canyons before — both near Lake Mead, NV and in Anza Borrega State Park, CA — but I can now confirm that those are downright boring compared to what’s going on here in southern Utah. 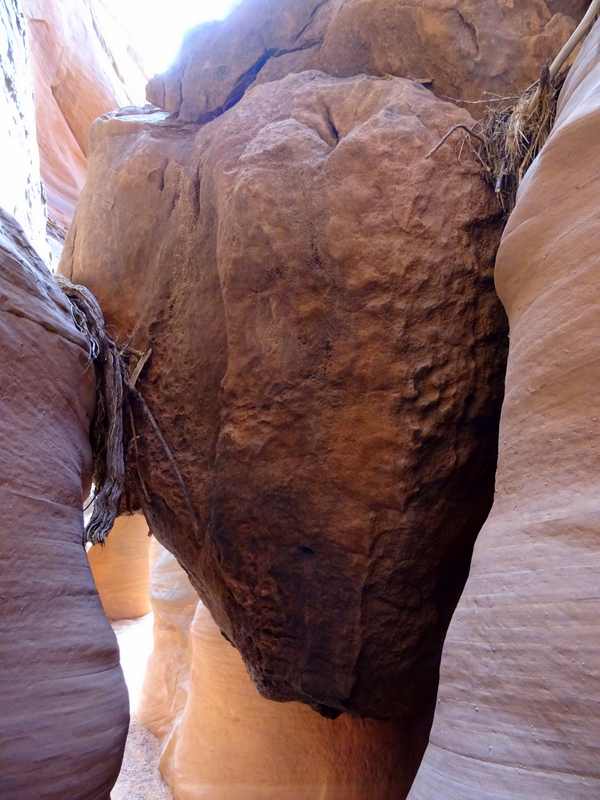 There are probably hundreds of slot canyons in this area, but only a few that are rated “non-technical” and suitable for us normal (wimpy) people who prefer not to use ropes or wade through several feet of water. 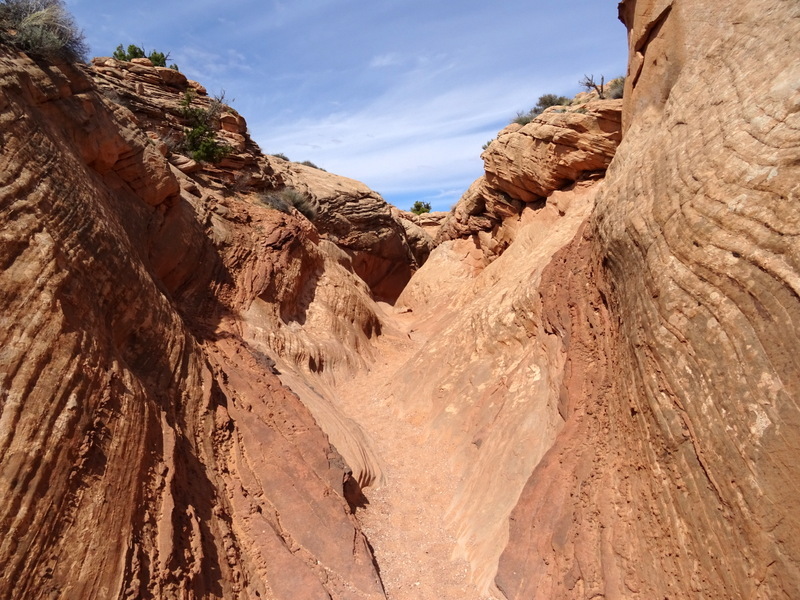 The two most popular are Peek-a-boo and Spooky gulch. Both are considered easy hikes, but don’t let that fool you into thinking they are for everyone. 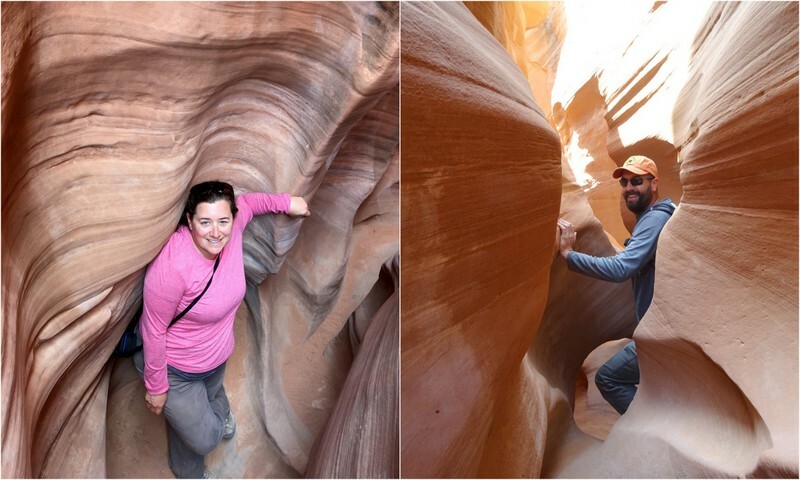 As you’ll see by the photos, these canyons may be rated “family friendly” but that doesn’t mean you should drag along grandma in her wheelchair, or your newborn in a backpack. To get to the canyons we drove back to Hole-in-the-Rock Road and followed it south for 26 miles. 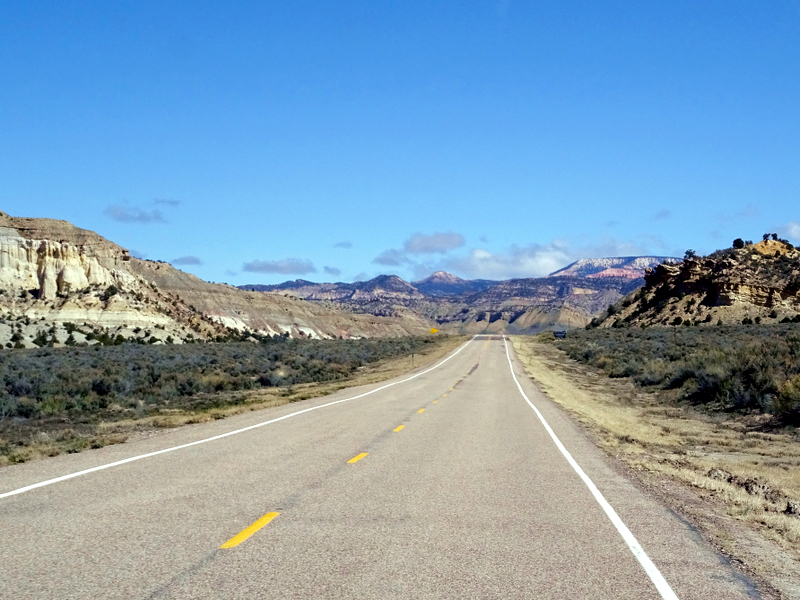 There are a number of interesting attractions and trailheads along this 62 mile dirt road that runs from Escalante all the way to the shore of Lake Powell. 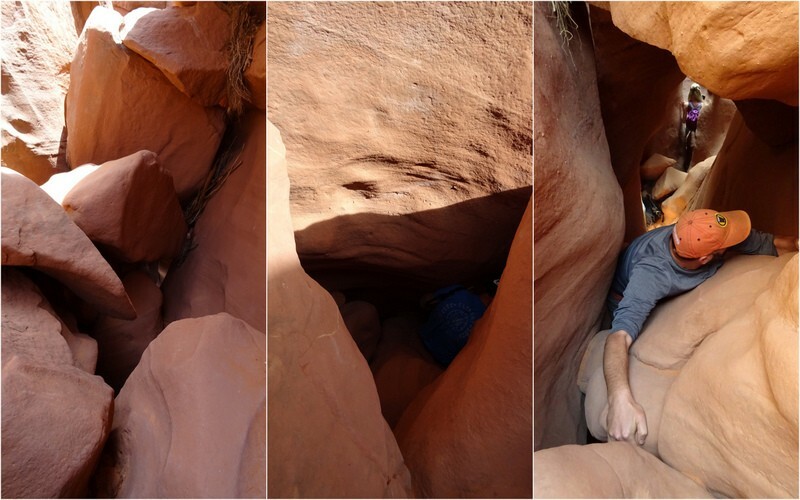 At the end you will find a narrow crevice — or hole in the rock — that early Mormon explorers used as passageway to get through the canyon and to the other side of the Colorado River. It’s a pretty impressive story of fortitude and adventure. You can learn more by visiting the NPS site or Utah History To Go. 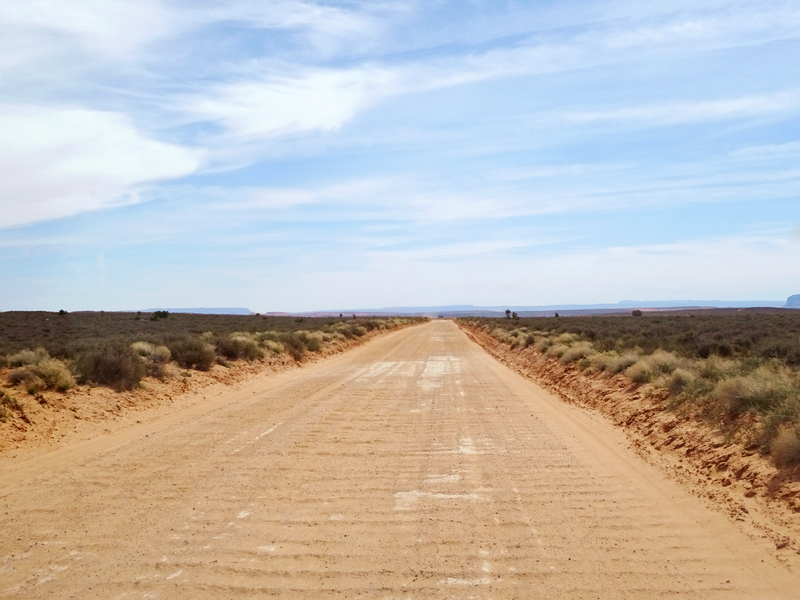 While we would love to drive all the way down to see where this incredible feat occurred, the road is covered with a teeth rattling washboard surface, and driving 26 miles each way was about all we could handle. 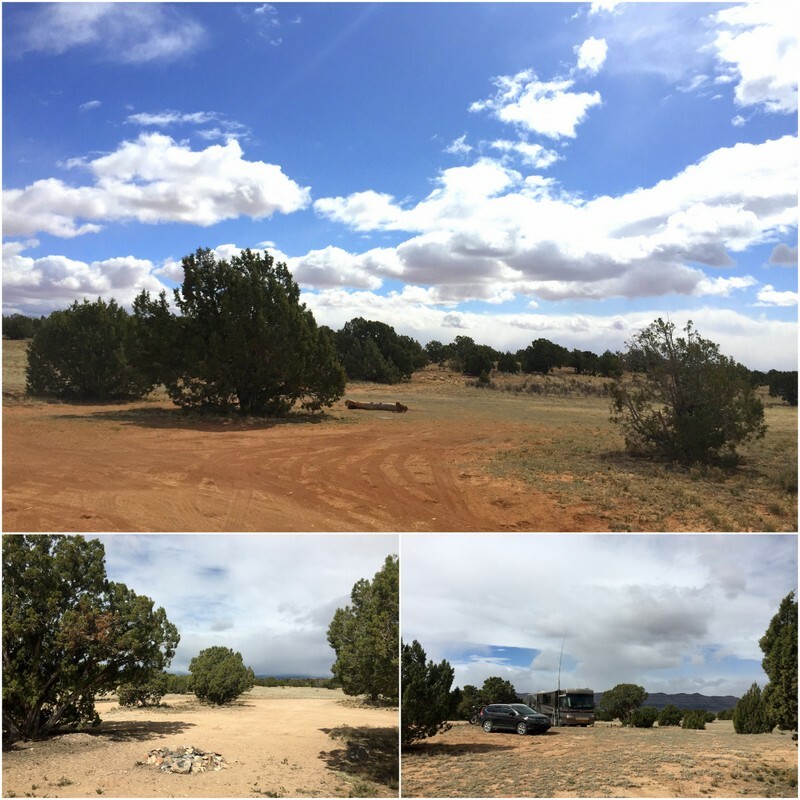 Soon we reached Dry Fork Road and drove an additional mile to the trailhead. The trail starts with a short but steep hike down into the sandy bottom of Dry Fork below. 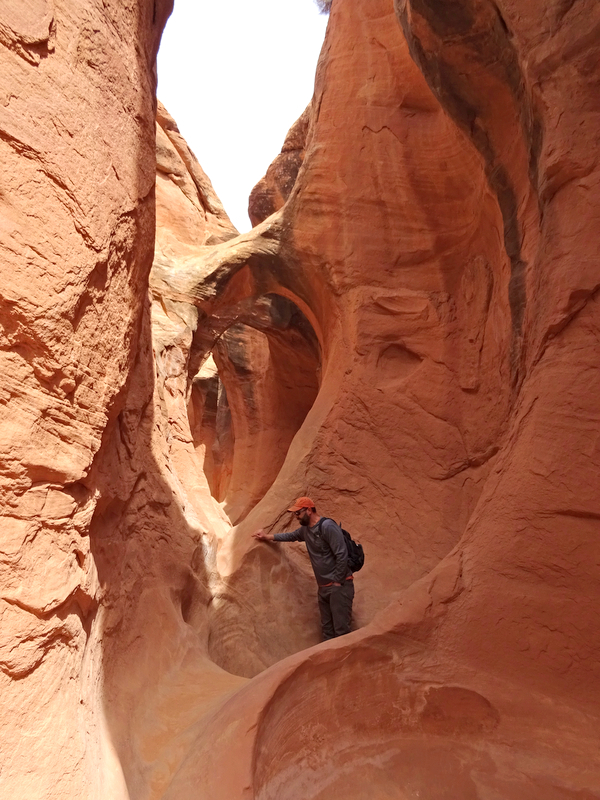 Once you reach the bottom the entrance to Peek-a-boo Gulch is immediately to the right. 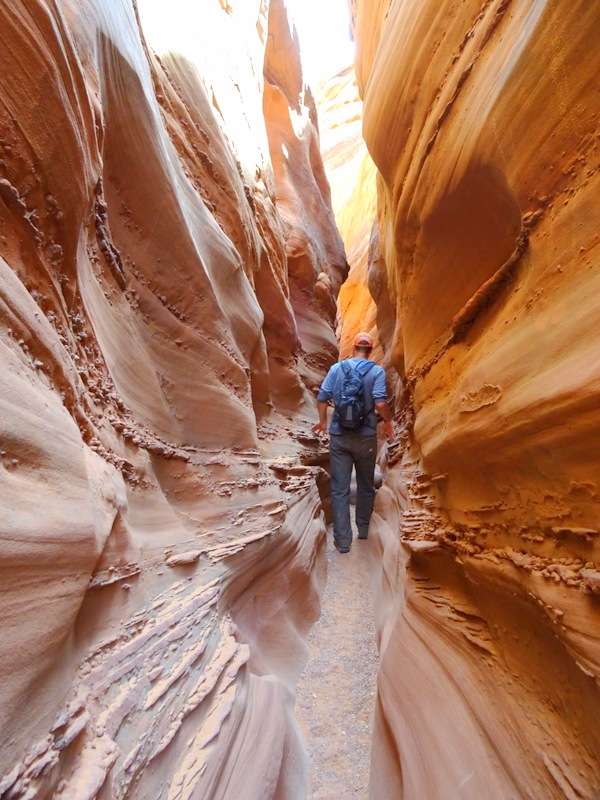 The two canyons can be hiked as loop, and there is some debate as to which direction is best. Personally, I can’t imagine doing it any other way then how we did it — up Peek-a-boo and down Spooky — but others say the same thing about the opposite direction so I suppose it’s all a matter of personal preference. The entrance to Peek-a-boo starts with a climb up a 20 foot rock wall. There are steps carved into the rock that Tim scrambled up with no problem at all. I, on the other hand, struggled a bit with the last five or six feet. I couldn’t figure out where to put my feet so I could reach up and haul myself over the edge. In the end Tim reached down and pulled me up. Without him I would have never made it. It may look intimidating, but if you’re a person of normal height (as opposed to 5’2″ like me) with a reasonable amount of upper body strength you should have no problem. After conquering that first obstacle we immediately encountered a few more 5-6 foot tall rocks that we had to climb up and over. I wasn’t sure I could do it at first, but after I watched a 10-year-old boy show his mom (who was about the same height as me) how to pull herself up and over the rocks, like you’re getting out the pool, is how he described it, I copied his technique and made it up all of them. It was not graceful though as I basically pulled myself up and flopped over the side like a dead fish, but I did it. Tim also helped me on numerous occasions by offering a helping hand. I can’t imagine attempting to hike this alone. Tim in front of a rock that we had to climb up and over. 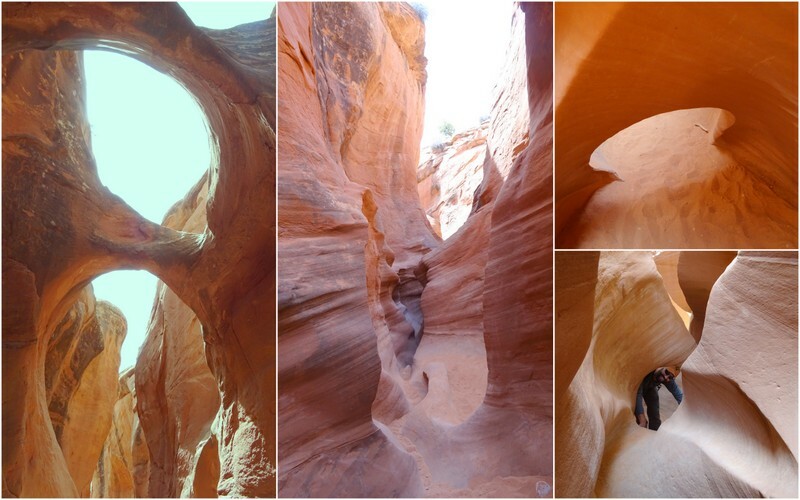 After making it through that section the rest of the slot canyon was a piece of cake. We marveled at the smooth rock walls, color striations, and impressive formations all around. Water sure can do amazing things. 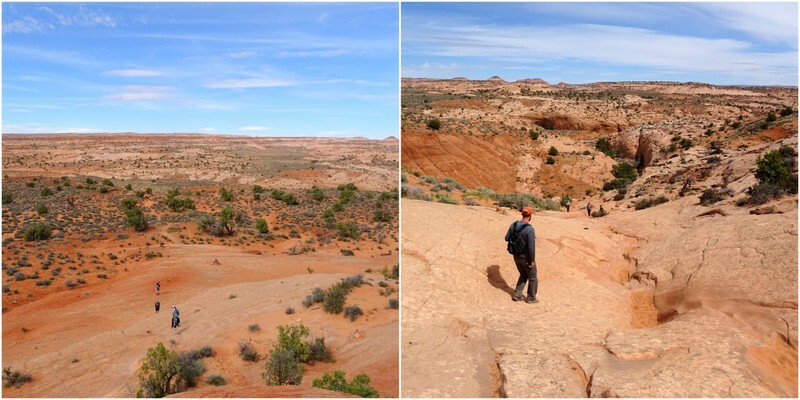 At the top of the canyon the rocks widened and we climbed up and out onto a flat, sandy plain. A well worn path and rock cairns led the way across the mesa and down into a wash where we found the top of Spooky Gulch. 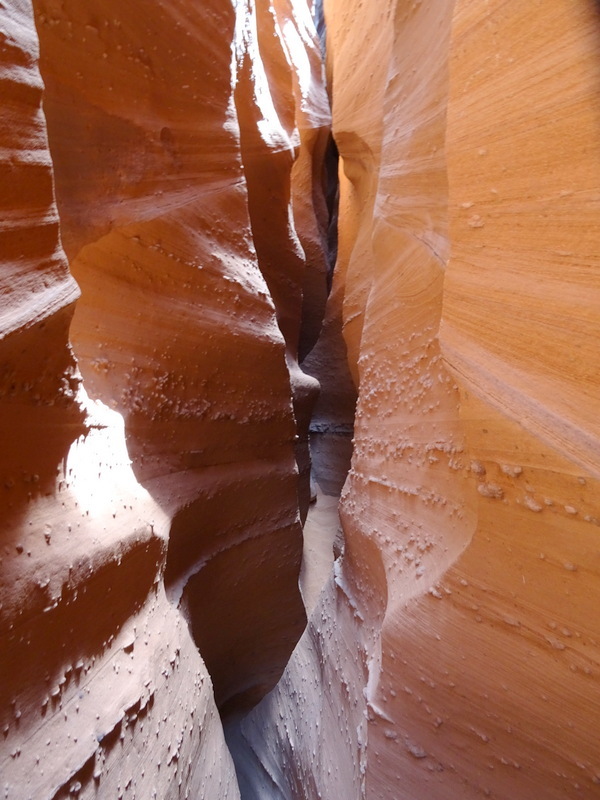 There are two main differences between the slot canyons. The first is that while the sides of Peek-a-boo are smooth, Spooky is covered with little rough bumps that give the walls a textured look. The second difference is that Spooky is much narrower than Peek-a-boo. Narrow enough that most people need to walk through sideways, some of us have to squeeze through, and some would not make it at all. It starts off pretty tame with a pleasant walk through the canyon. We enjoyed the beams of mid-day light light streaming through the roof of the canyon and had fun ducking around and under a sandstone arch. And then things got really interesting. We reached a massive rock fall obstacle that we had to somehow navigate down. The family that was in front of us in Peek-a-boo had almost finished making it down, and we watched as a trio of college kids went next. 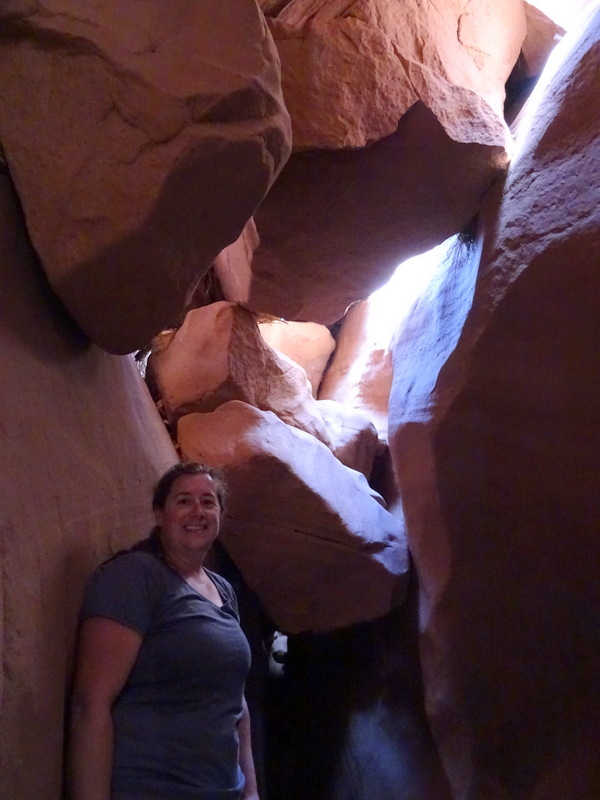 It was basically a giant jumble of rocks with a small opening that you had to navigate through and down. The drop down was around 10 feet. Tim went first and was able to shimmy down backwards while hugging the rock and then drop to the sandy floor below. He then made a cradle with his hands and I wedged one foot onto the side of the canyon, used him as a step for the other foot and let myself kind of slide down the rock. Both my arms got scrapped pretty good on the way down, but I made it and lived to tell the story. There’s no way I could have climbed up that without some sort of ladder, which is why I can’t imagine hiking this canyon in the reverse direction. Yup, I just came down through that hole! 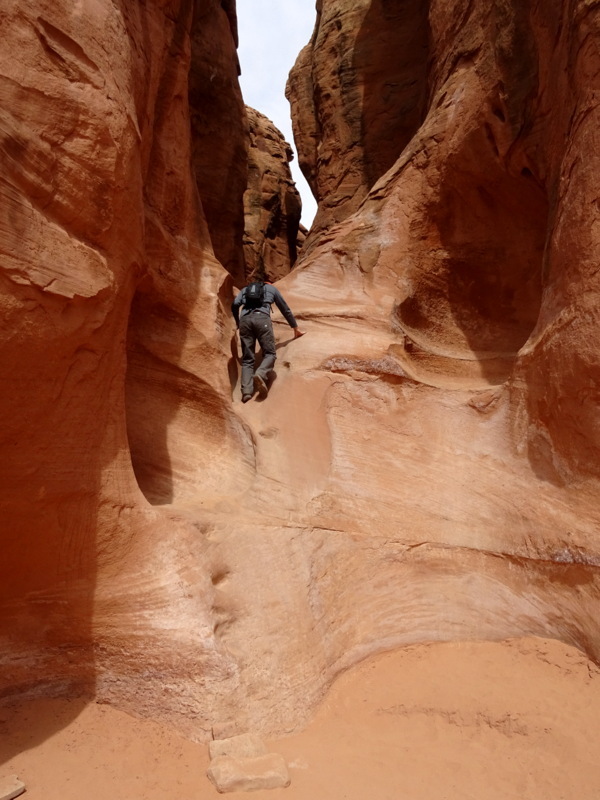 After that we encountered a few more obstacles we had to navigate down, but the hard part was mostly over — unless you consider squeezing your way through a twisting, increasingly narrow canyon with sheer walls on either side hard. Good thing neither of us are claustrophobic. Eventually the fun ended and we walked out a wide wash and back up to the parking area. 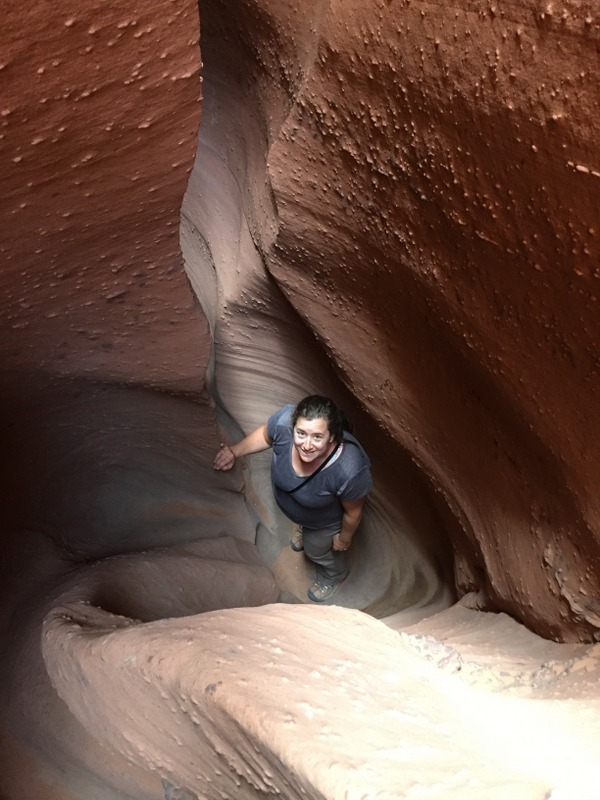 There is another slot canyon nearby called Brimstone, but we read that it’s even narrower than Spooky and usually has a few feet of water that you need to wade through. We decided to pass. We also wanted to see the Zebra Slots (where the walls are striped like a zebra), but it sounds likely to have water this time of year. More to add to the list for next time. 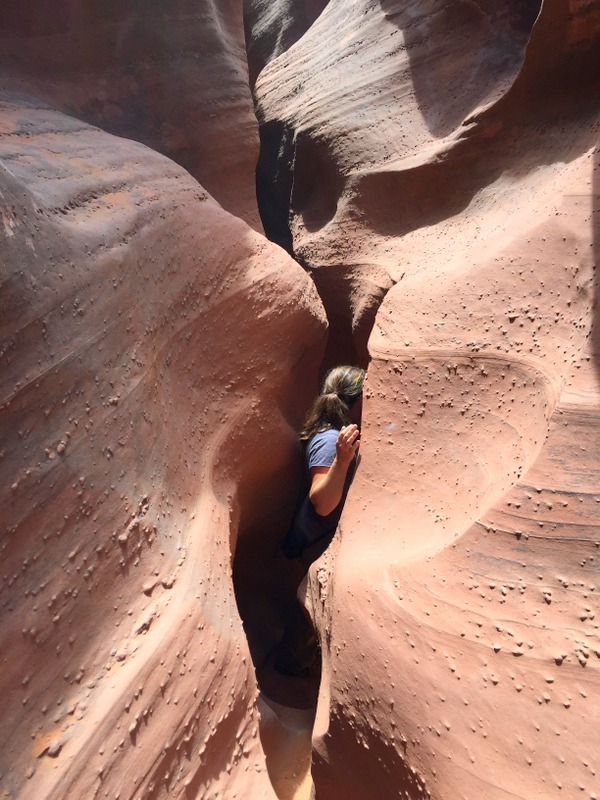 Obviously, if you are claustrophobic, not confident in your ability to scramble over and down rocks, or don’t enjoy stretching your physical abilities, this is not the hike for you. However, if you are looking for some adventure combined with incredible beauty go for it. Despite the difficult spots I would not hesitate to hike these slots again. These are considered kid friendly hikes. For the most part I would agree. Kids are small and would have no problem slipping through the narrow parts. And as long as you have two adults to help them up or down the rock falls they should be fine. Of course, if you have kids that need to be carried, or ride in a back pack, this hike is not at all suitable for them. 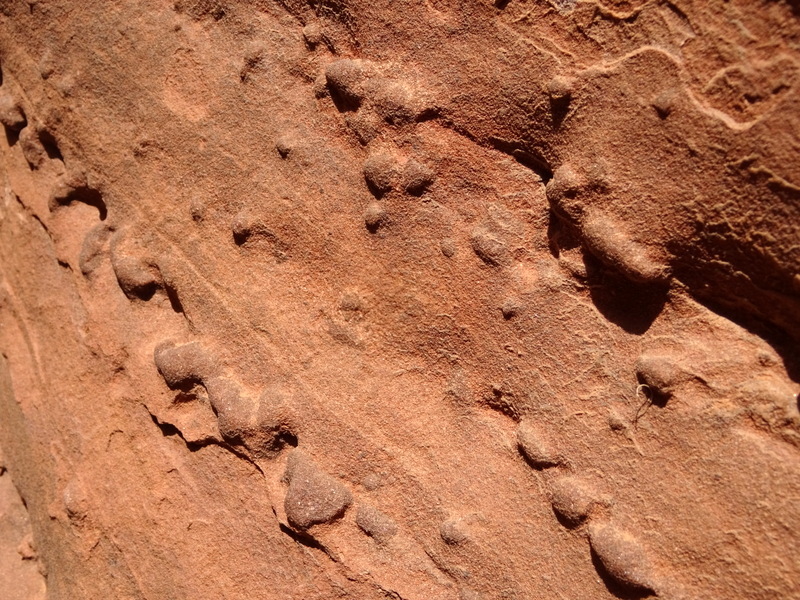 This should be obvious to most, but the danger of flash floods in these canyons is real. 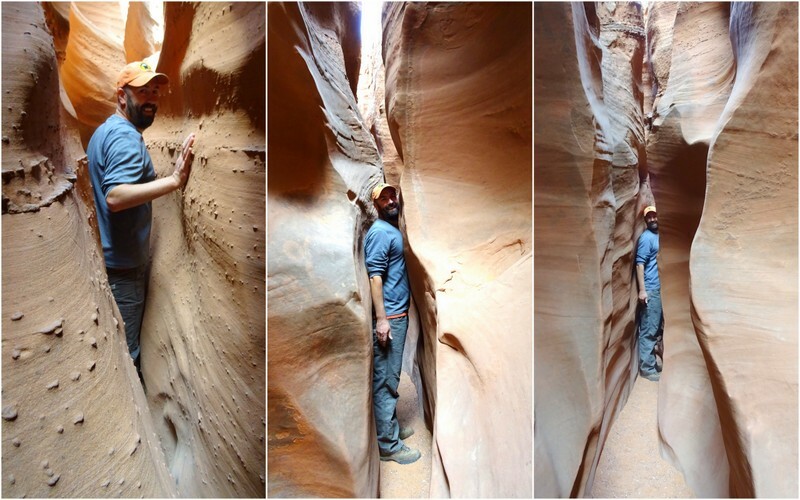 Never, ever go in a slot canyon if there’s even the slightest chance of rain! 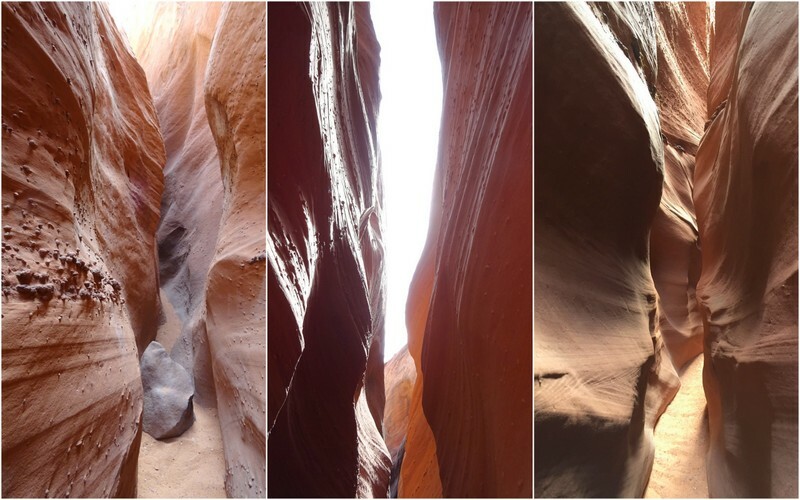 If this looks boring or not technical enough for you, never fear, there are tons of more technical slot canyons around to explore. You know the kind where you need ropes and rock climbing skills? The one we heard a lot about is called Red Breaks. Not for us, but if that’s your thing look it up. 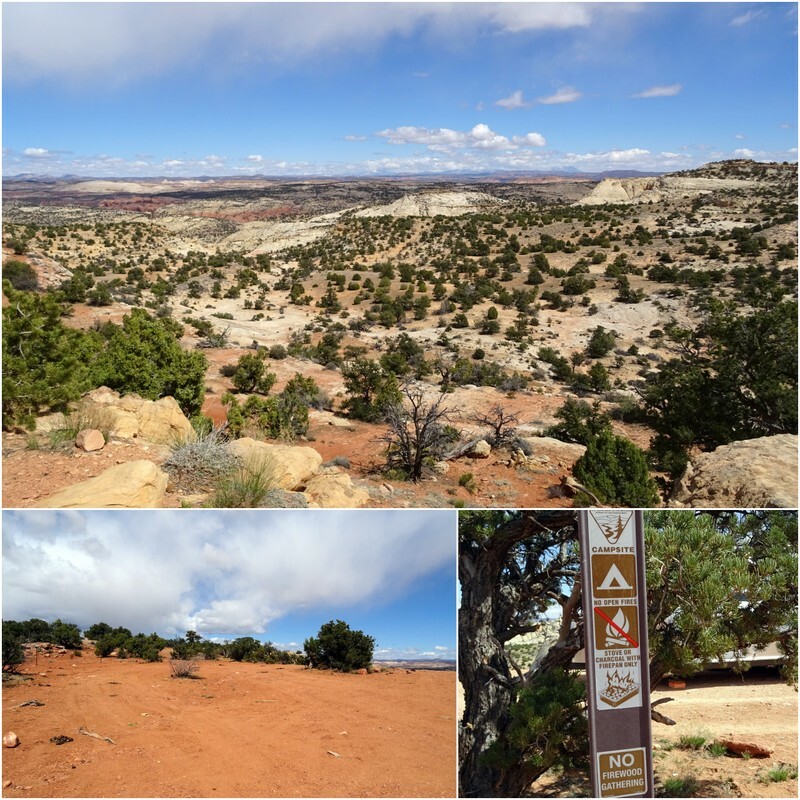 Up next: More hiking around Escalante! Yup, we scored big on both counts! Oh man, great adventure hike. Thanks for the boondocking info and nice pics.!! What an amazing campsite. That is one of my favorite areas in the country to take the Airstream. 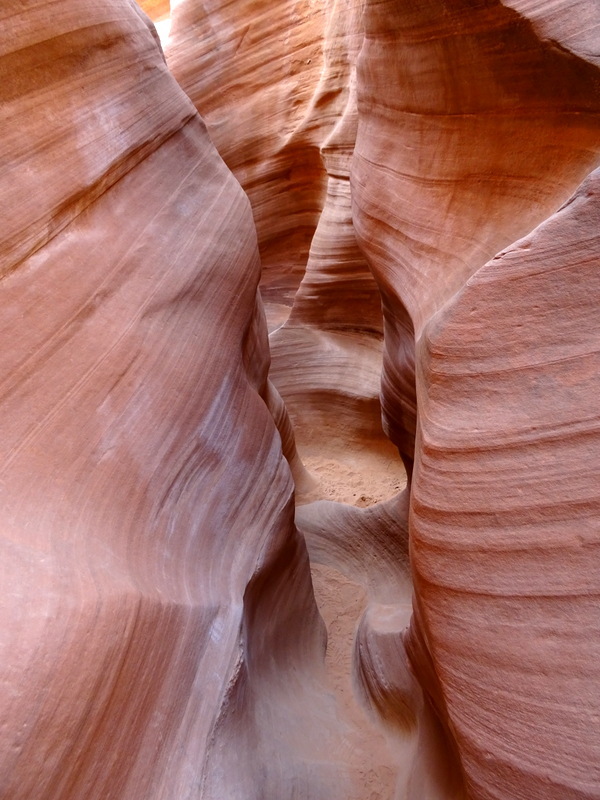 I love the slot canyon pictures and descriptions. I am also impressed that a cell signal is possible. I spent a few days down the road at Kodachrome Basin and there was absolutely no cell service. I look forward to your future posts about this area. This is one of our favorite areas as well. Hoping to spend a lot more time here next year. We were also surprised to find cell service. It’s a complete mystery as to where it’s coming from considering it barely works in town. It was truly on of the most amazing hikes I’d ever been on! As long as you have someone to give you a hand you could definitely make it up and down the hard parts. Truly the best slot hike we have ever done! We also went the direction you did and I too had a difficult time getting up Peek-a-boo…could not have managed without Hans! Utah is incredible!!!! I went back and re-read your blog post after we did the slots. Made me feel better to know I wasn’t the only one who needed help :) We are completely blown away by this part of Utah! I just read Man Corn Murders, a mystery novel that is set in the Escalante area. I gave the book a 4 out of 5 star rating mostly because of the setting as opposed to the murder mystery itself. But, it was a fun, quick read that brought back my many memories of that area. I hiked those slots 20 years ago. I am not a hiker or climber and I never quite found my comfort zone. But, I’m so glad I did it. I can’t imagine what those Mormon families went through on their journey through that area. I like my RV just fine, thank you. I have a WeBoost and am interested in the SureCall antenna you are using. If I order the antenna, what will I need to connect it. Tim says it’s just a generic cable, but he did need an adapter to fit into the weBoost. He recommends contacting them directly and asking what to use. Rumor is that they have great customer service. 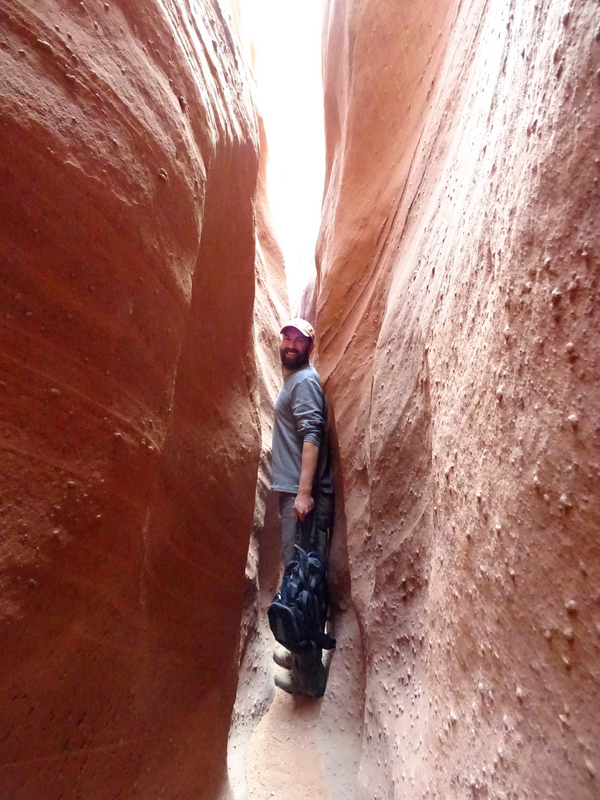 Yeah, if you don’t like tight spaces this is NOT the hike for you. We had a blast though. As you said, it was like a giant rock playground! What a great adventure..and you were not only brave, but strong. Hooray for both of you…your ability to take your readers right with you is wonderful. Thank you. Such fun. Glad you enjoyed coming along for the ride :) We’re working on pushing ourselves a bit more physically and this hike definitely stretched my abilities! Love your website and blogs. Some great info and spectacular pics along with enjoyable commentary. What I find amazing is that the two of you found each other and are doing something you love together. Keep it up and thanks. Spooky is such a cool slot canyon. I have not been to it for a few years but this post is making me want to get back to see it again. Also, we just want to send a quick note of thanks for all of the helpful information and resources you share on your blog. 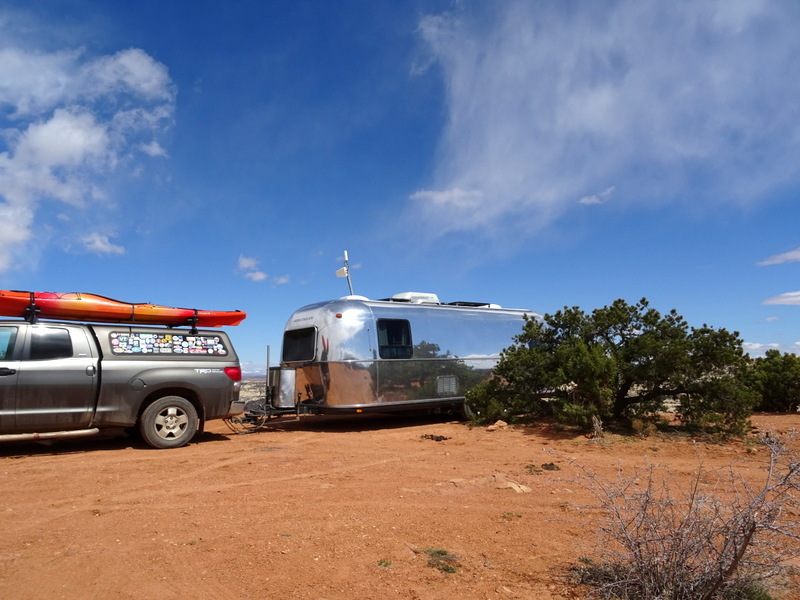 Your blog was very helpful when we were getting started with our Airstream a year and a half ago and your campsite information has been super-helpful since we started traveling (we can always trust your reviews of cell service!). 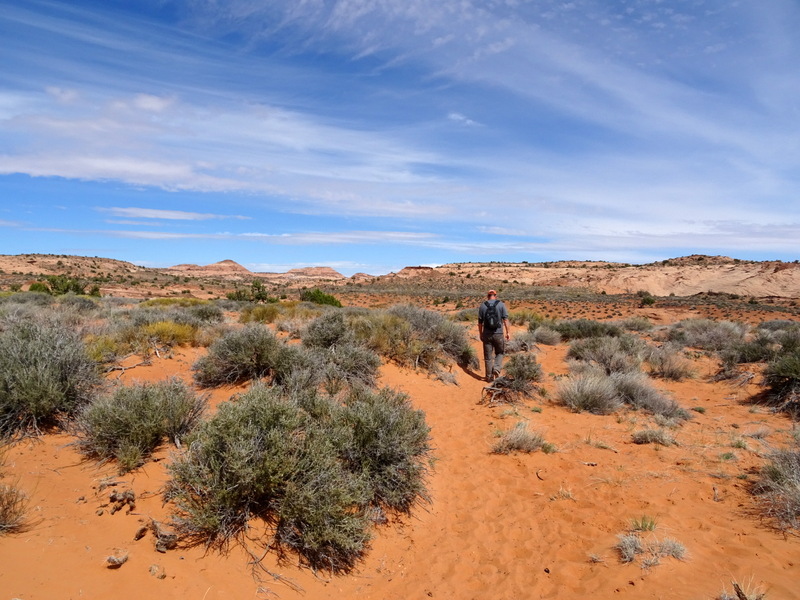 We are about a week behind you, staying at Stewart Point this week and headed to Capitol Reef next week. :) So, thank you for all the time you put into making your posts fun, interesting, and helpful! So happy that you are finding our blog helpful. We got so much much help from other bloggers when we first started, and are more than happy to share what we learn with others. 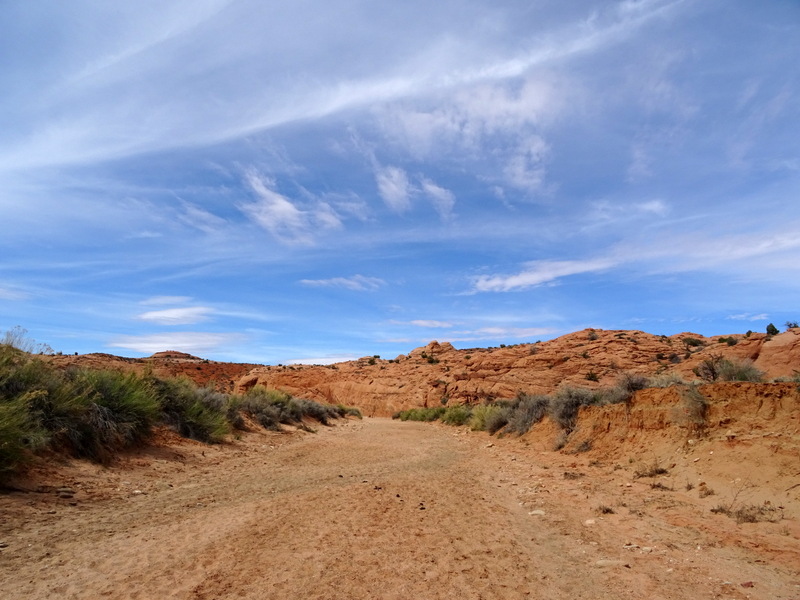 Enjoy your time at Stewart Point and Capital Reef. That’s where we are right now and it’s incredible! What cool hikes! I didn’t think I was claustrophopic, but looking at those photos of you and Tim squeezed between the rocks makes me a little queezy, so maybe I am, ha-ha. Looks like a blast though! 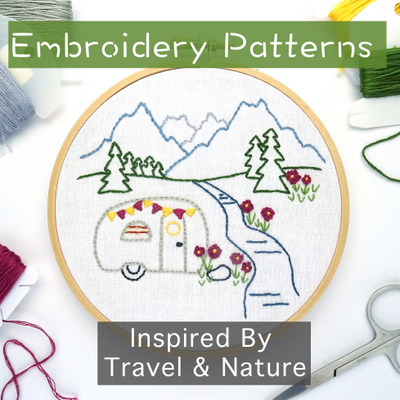 Loved your blog and photos! My husband and I are going to do this very trip in 3 weeks. A question for you……can you just pull off anywhere along the road if you are in a self contained RV? This is our very first trip, so no experience with the rules(laws). The rules are different everywhere. This area is a national monument where boondocking is sometimes allowed and sometimes it is not, but usually, is restricted in some way. National Forests and BLM land are more open with fewer restrictions. I would recommend using Campendium.com, stopping by the visitor center at national monuments, or contacting the ranger station in national forests to find out the rules. Amanda, thank you so much for this great information! This is exactly what we will be doing in two weeks and your helpful blog has covered, literally, everything I need to know for our upcoming trip to the slot canyon and boondocking. Thank you, thank you!